Oh My Gosh!!! I Just Found Out I Am Up For Writing Awards at Goodreads! OMG! This is BIG!!! I am so stunned! I can’t believe it! I am up for several awards at Goodreads! This is too good to believe! Goodreads! WOW! You might need join the MM Group then CLICK RIGHT HERE, type in “M/M Romance”. You will then need to click “Join Group” and wait for approval.!! First I am up for Favorite M/M Author! I can’t believe it! OMGosh! You can find the nominees for best M/M Author by CLICKING RIGHT HERE!! 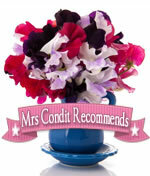 Then I am up for Best Hurt/Comfort for my novel Hound Dog & Bean! WOW! I sooooo love that book! Find the nominees for Best Hurt Comfort by CLICKING RIGHT HERE!! My Christmas Story “Grumble Monkey and the Dept Store Elf” is Nominated for Best Humorous MM Story at Goodreads! OMG! Please check it out! You might have to join the group first, but hey! I totally missed that I was up for something! I am so happy I am in tears! OMGosh!!! A Goodreads Award! OMGosh! You can find the nominees by CLICKING RIGHT HERE!! AND NOT ONLY THAT! But “A Taste of Honey” is up for Best Anthology! You can find the nominees for Best Anthology by CLICKING RIGHT HERE!! Two Awesome Reviews of Two Of My Audio Books! So I am home from work sick today and was feeling mopey and yucky and then I get notifications for two of my audio books. And both of them are fantastic! What a great turn of events. They sure put a smile on my face! Just check these out…. The first review is for the audio of “Bianca’s Plan.” It was done by Stacia Aurore Rose at Smoocher’s Voice. 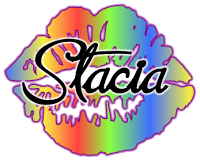 Thank you, Stacia! You can find the original review by clicking Right Here or check out Smoocher’s Voice review blog by clicking Right Here. Bianca worries that her daddy, Gavin, is lonely and decides he needs a boyfriend for Christmas. So she enlists her father’s best friend, the straight and unattached Curtis. Gavin has a Christmas wish, too, and Curtis setting him up on disastrous dates isn’t part of it! Meanwhile, Curtis finds life becoming complicated as he tries to please Bianca, make Gavin happy, and fend off his own unexpected mixed feelings. Will anyone’s wish come true? Paul Morey is one of my favorite narrators. His deep rich voice makes the book a pleasant listen. He does very well with the different voices and styles. Paul reads clearly and at a comfortable pace. Now on to the story of “Bianca’s Plan.” It was a sweet little story. Bianca is a ten year old girl whose plan was to get her daddy a boyfriend for Christmas. She had asked Santa for help but Santa cannot grant wishes that deal with matters of the heart. I’m not sure what I think about that part. It’s part of the story of why she had to do it herself, but my question is why does a ten year old still believe in Santa? On the other hand I still believe in the magic of Christmas. Anyway, Bianca’s character is written very well. She’d make a great Yenta which is a Jewish matchmaker. The girl is sneaky though, she has something up her sleeve and in the end no one knows what hit them while she looks smug. Bianca cons her daddy’s best friend, Curtis into helping her. Curtis loves that little girl as she was his own so he really couldn’t tell her no. He half-heartedly helps Bianca with what he thinks is her plan. Curtis knows it will lead to disaster or reveal something he himself doesn’t even know or want to acknowledge. I loved Curtis’ character, between trying to do the right thing for his best friend and Bianca and himself, half the time he doesn’t know whether he’s coming or going. Overall this is a terrific listen. Paul Morey did a fantastic job telling the sweet story that B.g. Thomas so wonderfully wrote. 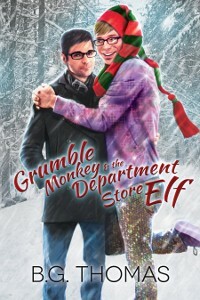 The second review was for “Grumble Monkey and the Department Store Elf” by Kim over at The Novel Approach. You can find the original review by clicking Right Here or check out The Novel Approach review blog by clicking Right Here. Nick is a very unhappy man—he’s achieved his professional goals only to find the rest of his life bleak and empty. Deciding there was only one way to make everything right, he is on his way to San Francisco on a dark mission, and even the horrible sleet storm that blocked his path won’t deter him. That’s when he found Kit. While driving to his destination through a sleet storm, Nick St. George is about to come to a crossroad in his life, Kit Jefferies. Kit is everything Nick isn’t, they’re complete opposites, but the good news is Kit’s enthusiasm for life is rubbing off on Nick—whether he likes it or not. For me, there are way too many people who are contemplating what Nick is considering a permanent solution to a temporary problem during the holiday season, or any other time of his life. It does get better, though, if one is willing to give it a chance. I fell in love with this story about a year ago when I first read it, so naturally, being an audible lover, I just had to have it in my collection. Donald Tursman did a great job narrating Grumble Monkey and the Department Store Elf, and I loved how he brought the story to life. It’s cute, funny, and well worth the time to give it a try. This book earns a 5 Star rating, as either a read or listen! Thanks to Smoocher’s Voice and The Novel Approach for such wonderful reviews. You support means the world to me! BLURB: Kit Jefferies, a part-time department store Christmas elf, is an artist who loves life and his family. Unfortunately, his car dies at a rest stop in the middle of nowhere as he is heading home for Christmas. Enter Nick St. George. JOSIE’S OPINION: Grumble Monkey and the Department Store Elf by BG Thomas, part of the Dreamspinner Advent Calendar Heartwarming, is the perfect Christmas Story. Nick St. George is an unhappy man, he may have money and success but he is lonely and bitter, his life pretty much a mess. Thrown out by his parents years before when they found out he was gay Nick lives his life conservatively, he doesn’t hide his sexuality it’s more that he doesn’t advertise it, no Rainbow Parades in Nick’s life, a decision that’s cost him at least one relationship. Driving to San Francisco on Christmas Eve Nick is caught in a blizzard and seeks shelter at a rest stop, there he encounters obviously gay, out and proud artist Kit ‘Kitten’ Jefferies who’s trying to get home, which just happens to be in the same direction Nick is traveling. Nick very reluctantly agrees to take Kit home, at first Nick finds Kit annoying, he won’t stop talking, he’s bubbly and happy, but as they travel Nick warms to Kit. Kit is also attracted to Nick but finds him difficult initially, calling him Grumble Monkey in reference to all the moaning he does, but as they get closer to Kit’s home the men draw closer. What happens when they get to Kit’s destination? Will Nick just wave goodbye and carry on to San Francisco? I loved this story, it reminded me of films I’ve watched of strangers forced into road trips across America. Kit is sociable, he talks a mile to the dozen, he’s jolly, bubbly and he loves Christmas, exactly the opposite of Nick. Nick is tired and jaded. Tired of trying to prove himself to parents who don’t care, tired of trying to fit into a world that doesn’t want him, at least not as he is. Travelling with Kit forces Nick to revaluate his life, in fact Kit brings out the best in Nick, something the reader realises long before Nick does. Cover Reveal! My Christmas Story, “Grumble Monkey & the Dept. Store Elf” – Paul Richmond Artist! Is there anyway I could be happier with my new cover? I don’t think so! OMG! It was created by the loverly and talented Paul Richmond and it in now way could convey my story any more than it already does. I am SO happy! Soo soooooo soooooooo happy! And just wait to you read this story! You are going to love it! Here is the blurb: Kit Jefferies, a part-time department store Christmas elf, is an artist who loves life and his family. Unfortunately, his car dies at a rest stop in the middle of nowhere as he is heading home for Christmas. Enter Nick St. George. I hope you will enjoy it and I will let you know when it is available!